Did you know a grand piano weighs between 500 and 1,300 pounds and has more than 1,000 moving parts? To most of us, that’s just a nice fact to know if we ever appeared on Jeopardy. But if your business is transporting pianos, sometimes long distances, it’s one of many things you need to know to ensure safe delivery of these precious yet very delicate musical instruments. NJBIA member O’Mara Meehan Piano Movers, based in Bellmawr, has been in the piano moving business since 1874. And it’s still owned and operated by the O’Mara family, now in its fourth generation, under the guidance of brothers Charles, Jr. and Bryan O’Mara. The “Meehan” portion of the company name came from the fact that founder Tom O’Mara wanted to emigrate from his native Ireland to the U.S., but needed a sponsor, which was the custom back in the mid 1800’s. It was the Meehan family that served as his sponsor and in deference to this support, the Meehan name was put on the formal business title where it remains today. As if you have to ask why you need a professional team to move your piano, the company shares the following quote on their website: “The bitterness of poor quality service remains long after the price is forgotten.” That’s a more refined way of saying, “You get what you pay for.” And it’s true! It’s not just the weight of a piano that presents a challenge to move, but the fact that it is asymmetrically shaped and both its outer cabinet and inner mechanics are very fragile. Proper equipment is needed, of course, but even more so is an understanding of the unique dynamics of balance and inertia for pianos with their uneven distribution of parts and weight. So, the next time your high school child asks you why they have to take physics, you now have an answer with a practical application. One noteworthy delivery was that of a grand piano to the University of Pennsylvania Music School that was too big to fit through the front doors. 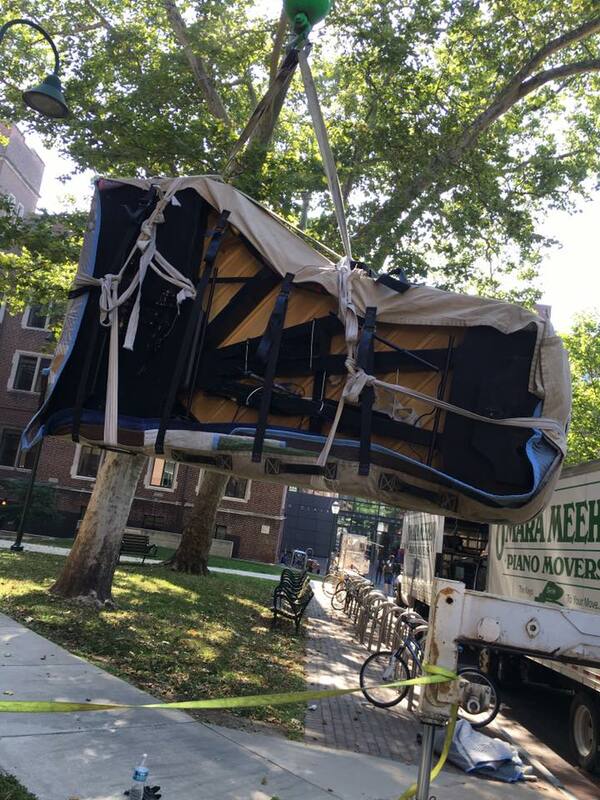 First, a crane was required to lift and then lower the piano onto the roof. From there, it had to move through a service door and down five steps into its new home in the concert hall on the 4th floor; but first all the HVAC ductwork had to be removed so the piano could fit through this rooftop service entryway. In addition to moving pianos, the company can also store and dispose of them once they have outlived their usefulness. Congratulations to the O’Mara family for their very long-term success as a family business. For more information, visit their website and their Facebook page. O’Mara Meehan Piano Movers is just one of 20,000 companies that comprise NJBIA’s membership, which is very diverse with representation from an amazingly large and wide spectrum of fields, industries and professions. Look for more unique stories about NJBIA members in future issues of “Beyond 10 West Lafayette,” NJBIA’s membership blog. I want to make sure that I get my piano moved properly. I didn’t realize that there were so many different moving parts to a piano! It makes sense that I would want to rely on a professional for this. I don’t want to risk damaging it or anything. Wow, You are share the right information on this blog. Piano moving is very difficult task. I’ve enjoyed reading the post. It is very supportive and useful information on moving piano. I would like to visit the post once more its valuable content. Thanks for such post and please keep it up. I would like to be certain I receive my own piano transferred precisely. I used ton’t understand that there had been really so a number of moving components into some piano! It is logical which I might like to be dependent upon a specialist with it particular. Idon’t desire to chance damaging anything or it.